This is an easy, though long, walk along the St James Walkway. The only slog is up to Anne Saddle (1136m), about an hour north of Rokeby Hut. There is no efficient way of breaking this day into two, unless you camp, or possibly stay at the basic Rokeby Hut (3 canvas bunks). 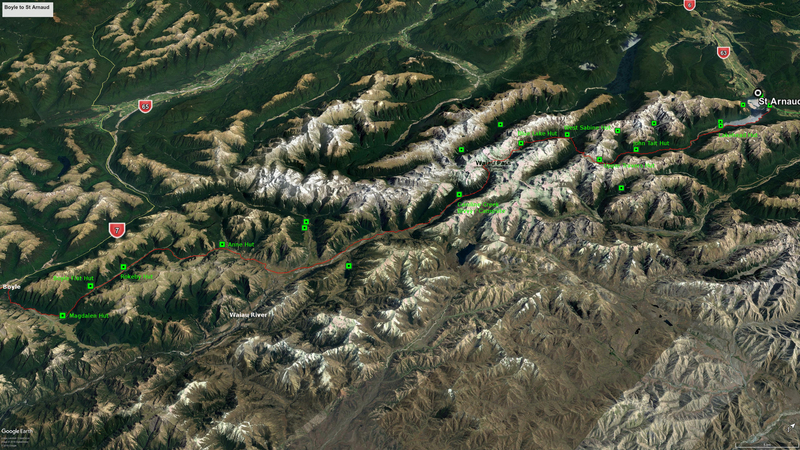 Boyle to Boyle Flat Hut (14 bunks), 4 hrs. Boyle Flat Hut to Rokeby Hut, 1 hr. Rokeby to Anne Hut, 4 hr 45. There is the side track to the small modern Magdalen Hut (5 bunks) before you get to Boyle Flat too. Anne Hut is a modern, spacious hut with a short-wave radio. This is useful for checking the weather before you head over the Waiau Pass in two days time, as that is not a good place to be in bad weather. You could get a weather report from the office at Boyle as well, and use their phone to call the DoC visitor centre in St Arnaud (03 521 1806) to ask if the pass is snow free. The route continues on the wide open grass and tussock land that surrounds Anne Hut for another long day. At the Ada River the St James Walkway goes off to the left and you continue on to the Waiau Pass Track, giving the privately owned homestead a wide berth on your left. Waiau hut, three kilometres north, has now replaced the decrepit Caroline Creek Bivvy. The site of the former bivvy is a nice spot for camping, under the shelter of trees and with a camp fireplace of rocks. There is further potential for camping on the way up to the Upper Waiau Forks, at a camping spot just before the forks in particular. 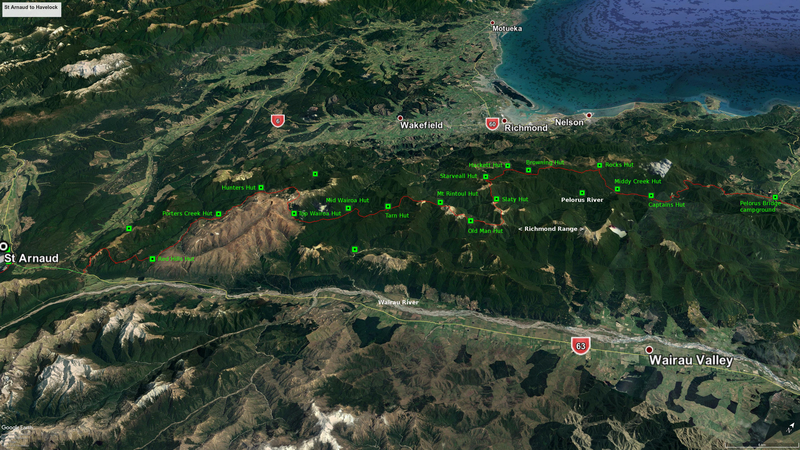 Then it is a steep climb to Waiau Pass (1870m). This is one of the most difficult sections of the TA and one that shouldn’t be attempted in poor weather. At certain points you are climbing or scrambling up steeply sloping sections of rock. A reasonable head for heights is required. The descent on the other side is quite different and is mostly down steep scree slopes. The track skirts round the left of Lake Constance and then goes up steeply to the left part-way around to avoid rocky bluffs that go right to the water. Avoiding this track, by going around the bluffs at lake level, is almost certainly impossible. After crossing the rocky boulder moraine dam of Lake Constance the stunning Rotomairewhenua / Blue Lake and its nearby hut come into view. The lake is said to have the clearest fresh water in the world. This is because it is fed by water from Lake Constance that has been filtered through the moraine. The waters are considered by Maori to be tapu (sacred). Respect the lake and this cultural belief by not bathing, washing your clothes, or cleaning your dishes in it. There is a plan to install a warden at the hut to help curb this sort of insensitive behaviour. You are now in the Nelson Lakes National Park. This is a popular tramping destination, so expect to see plenty of others on the trail and in the large modern huts. Its popularity is deserved, and TA hikers often rate this section of the trail as one of the South Island highlights. The way down to West Sabine Hut (34 bunks), 3 hrs, is rocky and slow but well marked. After facing a tough ascent the previous day you then have another – up to the Travers Saddle (1787m, 3 hrs). There is an amazing deep chasm crossed by a bridge about 2.5 km from the West Sabine Hut before the steep climb to the saddle. The downhill descent on the other side is easier, taking you to Upper Travers Hut in 1 hr. (The time from Upper Travers to West Sabine in the TA trail notes of 6 to 8 hours (and DoC of 6 to 9) seems grossly overestimated and there is no reason to think it would be slower going south to north – quite the opposite in fact). Upper Travers Hut is an excellent place to stay, as it has a view right over the valley below. It is easy, downhill walking to Lake Rotoiti and then along a wide flat track around the lake to St Arnaud. The small detour to Travers Falls about 9 km down from Upper Travers Hut is well worth a stop. It is clearly marked. There are plenty of nice camping spots from John Tait Hut to Lakehead, though the national park is well known for sandflies. If you feel like another steep climb you could take an alternative route to St Arnaud and go up to Lake Angelus and then down the very exposed Robert Ridge. The hut needs to be pre-booked, though there is camping by the hut. Upper Travers Hut to John Tait Hut, 2 hrs 15; Tait to Lakehead Hut, 4 hrs; Lakehead to St Arnaud, 2.5 hrs. The track ends at the Kerr Bay Campground, St Arnaud. St Arnaud is a small tourist town, with a limited range of supplies. The DoC visitor centre (open 8am to 4.30 in summer) sells camping gas and dehydrated meals and may accept food parcels but you should check this. The general store has an associated café with fantastic meat pies and, at peak times, fish and chips. There is a more upmarket café at the Alpine Lodge. The 24 hr NPD St Arnaud Alpine Store sells methylated spirits and screw-on gas cannisters, but if you are relying on either it would be best to phone ahead to make sure (03 521-1854). Kerr Bay Campground – DoC operated. Cooking facilities, toilets and showers (not running in winter). Bookings at the DoC Rotoiti / Nelson Lakes Visitor Centre, 03 521 1806, View Rd. Alpine Lodge St. Arnaud – 75 Main Rd, St Arnaud, 03 521 1869, info@alpinelodge.co.nz. Dorm and private rooms. Food parcels can be stored for $5 for guests or $10 for non-guests (address 75 Main Rd, St Arnaud, RD2, Nelson 7072). Nelson Lakes Motels and Travers-Sabine Lodge – SH63, St Arnaud, 03 521 1887, info@nelsonlakes.co.nz. Food parcels are no longer accepted. To get to Nelson the only direct transport service is Nelson Lakes Shuttles, who run scheduled services in summer on Monday, Wednesday and Friday at 8.30am ($50 per person). 03 547 6896 or 027 222 1872. Intercity Coachlines run between Westport and Nelson every day and stop for booked passengers at Kawatiri, the junction of SH63 from St Arnaud and SH6 between Nelson and Westport. This is 25 km to the west of St Arnaud and the departure times are 6.15pm to Nelson and 8.34am to Westport. 03 365 1113. Atomic Travel use the same service. The Heaphy Bus Company go to Nelson and Westport from St Arnaud on Sundays and Thursdays in the summer months. This section on the Richmond Alpine Track over the Richmond range and then along the Pelorous River is a further highlight for many on the TA South Island trail. It is the toughest part, and also the longest without a place for resupply, so packs will be heavy to start – that’s eight nights of food if you do it as set out here and walk through to Havelock. The huts are mostly small, as few people travel over the tracks and the only people you see will probably be other TA walkers and hunters (many of the huts were built as deer culler huts, hence their age and basic nature). You will not want to be on the higher, exposed parts in bad weather, so check the forecast before your leave St Arnaud. If you do want to exit the trail at some point then Hackets Hut is the usual place out that is closest to civilisation, but it would be more effort than it is worth if you just need to get more food. 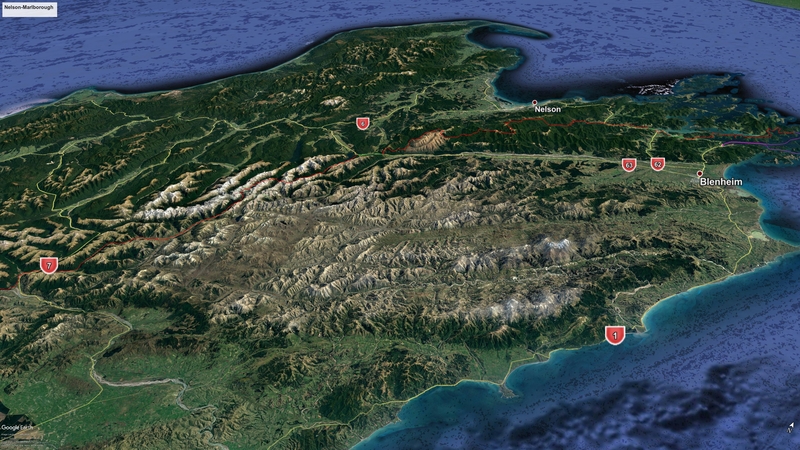 Nice places to stay for their locations are Red Hills, Hunters, Tarn, and Mt Rintoul huts, amongst others. The first part of the route, from St Arnaud to Red Hills Hut, has been changed in 2017. The following is the old route and the time and km above are for that (9hrs, 28.5km): The first section is road walking for 2 hrs. The track turn-off is at the end of the 5 Mile Scenic Reserve at the bottom of the hill before a one-way bridge. It is then 1 hr 50 up a long steady incline on a 4WD track to Red Hills Hut (6 bunks), a pleasant modern hut with a nice outlook that catches the afternoon sun. However, you may wish to do the new route, as per the map, which involves turning off left on Tophouse Rd and taking the track off its right after about 700m. This is about 1 km less road walking than the 5 Mile Scenic Reserve option above, but involves a steep climb to peaks at 1,100 and 1,200 m (with great views) up a mountain bike track, and is 3 km longer, so it would probably extend the St Arnaud to Porters Creek Hut time to 10.5 hrs. You might choose to go only as far as the Red Hills Hut on the first day. Then go to Hunters Hut (8.5 hrs) the next, and to Top Wairoa Hut (9 hrs) after that, or just to Mid Wairoa Hut (5 hrs) after Hunters. The track from Red Hills Hut downhill is very difficult going, beginning as boggy and then becoming very rocky, with a good deal of up and down. The sign at Red Hills Hut says 4 hrs to Porters Creek but this is an underestimate and is more like 5 hrs 15. A tricky way-finding bit is the last section up Lowther Creek after its confluence with Porters Creek, as the TA map is not sufficiently detailed here. There are no poles at first, but as you go up the wide, rocky Lowther Creek bed a poled route up the steep side to the left will become evident. The hut is well up on a boggy plateau. It is more up-and-down travel over a boulder strewn track to Hunters Hut (8 bunks), 3 hrs 15, 7 km. About 20 minutes before the hut you will see black boulders on the trail. Pick a smaller one up and you will find it remarkably heavy. This is magnetite, an iron ore. Hunters Hut replaces an earlier one in the area that was swept away in a flash flood, killing two DoC workers inside. The hut is better sited now, so no need to worry about this happening again. From Hunters Hut it is a descent down to the river and an easy crossing without getting wet feet. Then it’s a long grind up onto open tops where you get a panoramic view of Tasman Bay. There is no water source from the river crossing to Top (aka Upper) Wairoa Hut. After weaving around the ridge lines the descent to the orange-painted hut is slow and very difficult through tussock and fields of jagged boulders. It is relatively slow going down the valley to Mid Wairoa Hut (6 bunks), 4 hrs, on a narrow track with many tree roots and rocks and about eight river crossings (which may be difficult after rain). The hut is on a grassy flat and is a good lunch stop. (If the weather is not looking good for heading up to Mt Rintoul you could always go downstream here and cut across to Starveall Hut, though the the latter is still fairly high up.) After crossing a swing bridge it is a steep climb up through forest for about an hour, along ridges and then another less steep climb. Finally there is a downhill detour to Tarn Hut, set at the forest edge of a clearing that is also suitable for camping. The tarn is very picturesque and it is worth a detour even if you are not stopping here. Once back up to the ridge, the track wends its way along though bush, with a climb up to Purple Top and then more ridge walking through bush to Mt Rintoul Hut (6 bunks), 3 hrs 45. There is cellphone coverage from Purple Top onwards. The hut is positioned with a great outlook and big windows. It would be a good place to stay and watch a sunset. If you are pressing on, top up with water as there is none along the ridges. This is the most difficult section of the Richmond Alpine Track. First is the steep climb up to Mt Rintoul (1731m, the highest point on the track). Near the top it looks like you descend very steeply but it is just a short diversion to get you round the next peak before Mt Rintoul. From Mt Rintoul you can see the hard part ahead, as the track descends steeply off to the right and then comes back up equally steeply to the top of Little Rintoul. This is not a section for the faint hearted, nor in poor weather. A short way along from Little Rintoul is the diversion to the right to Old Man Hut. It is quite a long way down to the flat clearing and the hut. And of course, you have to make the haul back up the next day to the ridge track, though by a different, somewhat shorter track. It is a half hour climb to regain the ridge. The walk along it amongst stunted beech and open tops to Slaty Hut (6 bunks) takes 4 hrs. And from there it is 2 hrs to Sarveall Hut, which is nicely positioned for the afternoon sun. It is down through the forest all the way to Hacket Hut (6 bunks), 2.5 hrs. There are about seven stream crossings but with boulder hopping in low flows you can avoid wet feet. If you need to exit the trail for resupply, this is the place to do it. The Hacket Track takes you down the Hacket River to the car park on Aniseed Valley Road (approx 1.5 hrs) and from there it is 10 km to Hope, behind Richmond, a major satellite settlement of Nelson city. There is a large supermarket in Richmond or you could continue on to Nelson (29 km), which has outdoor stores, supermarkets and many backpacker accommodation options. The Pear Orchard (BBH) – 569 Hill Street South, Hope, 03 544 5361. Rooms range from dorm to private rooms with ensuite. 3km or so from Hope School. Browning Hut to Rocks Hut: 4.5 hrs. To continue on the TA, you now begin on the Pelorus River Track. It is a short distance from Hacket to Browning Hut (8 bunks), 1 hr. About 20 minutes along there is a sign to the high river track to avoid a stream crossing. This involves a steep climb up, and the stream crossing duly averted is minor in normal flows (but there is another crossing after the detour finishes anyway), so there is probably no need to take the high track. It is then a stiff climb up through forest followed by a long, gently rising ridge, with some sidling here and there throwing in undulating sections. The track is a little rough, with many tree roots. The hut is modern and spacious and has a flushing toilet. There is no cellphone reception here but you can go further up to a lookout spot where there is patchy reception and a view. Take care to note your route, as it is difficult to find the track again for the way down to the hut. From Rocks it is easy walking 1.5 hrs downhill through bush to Middy Hut (6 bunks). Then easy, flat bush walking to Captains Creek, 2 hrs. The trail begins as a narrow track winding around hillsides for the first 2 hours. Then as it comes back down to the river it widens and becomes a flat easy walk to the road end. An hour or so before the road is the pleasant Emerald Pools picnicking area where you could perhaps camp. Once the track ends it is road walking (no water sources) along the mostly gravel Maungatapu Rd that is flanked by increasingly well-manicured lifestyle blocks. There is little traffic. The Pelorus Bridge DoC camp ground, found by turning right and crossing the bridge at the end of the road where it meets the main highway, has a nice café for tourists but no groceries for sale. You pay for camping in the café. The camp ground is a pleasant spot overlooking the river. It is mainly frequented by campervans, and has toilets, showers and a cooking building (but no cabins). DOC Pelorus Bridge Campground – 03 571 6019, p.b.cafe@xtra.co.nz. After leaving the camp ground head back over the Pelorus Bridge and take the Circle Track directly opposite Maungatapu Rd. It is indeed a circle and it doesn’t matter which way you go, for Dalton’s Bridge track still leads off it about half way round. This track goes across farmland until Dalton’s Bridge. You are expected to follow the marked route along the fence line and strictly not take the farm road. Then you continue in the same direction on Kaiuma Bay Rd. It is road walking on a mostly gravel road with very little traffic. Take Te Hoiere Rd at right over the bridge, and then, after the road becomes Boulton’s Rd, another bridge to bring you to the main road, SH6. Then 2.5 km of unpleasant walking beside a very busy stretch of road brings you to Havelock, a village based on mussel farming and tourism. A number of restaurants and cafés line the streets (some closed Mondays). Inlet Bakery and Café has poor service, but maybe the staff in question have left by now. Anyway, there is a post office (in the pharmacy), an information office, a petrol station, a bus stop marked on the road surface for Intercity buses travelling between Nelson and Picton, a small Four Square supermarket, and various places to stay. The motor camp is right in town, down Inglis St. Consider buying your pass for the Queen Charlotte track at the iSite and booking a water taxi from Ship Cove (see later) while in Havelock as your options may narrow later. Blue Moon Lodge (BBH) – 48 Main Rd, 0800 252 663; 03 574 2212. Rutherford Backpackers – 46 Main Rd, 03 574 2104. Havelock Garden Motel – 71 Main Rd, Havelock, 03 574 2387. Havelock Holiday Park – 24 Inglis St, Havelock, 03 574 2339. Continue on SH6 out of Havelock, then turn left into Mahakipawa Rd, which changes into Queen Charlotte Drive within a few hundred metres. When you have crossed the Kaituna River there is a sign at the base of a hill to a refuse station at right. Opposite is another to the Link Pathway / Te Ara Tuhono that goes around the peninsula before rejoining the Queen Charlotte Drive. Walk along the side of the road here for about 1km before a bush track at left offers respite for another km. Then it is more road walking up to, and along, the Linkwater Straight (still Queen Charlotte Drive). A quarter of the way across the Straight there is a petrol station and a café opposite, and 2 km later a school (with accessible toilets and water). The Smiths Farm Holiday Park is 500m past the school. From the school a footpath takes you along the left hand side of the road to the Anakiwa Rd turn off at left. Take the gravel path on the right hand side of Anakiwa Rd. After 1 km this becomes a bush track that brings you into Thompson Bay. YHA Anakiwa and Anakiwa 401 (at the far end of the bay opposite the second wharf) are here. Smiths Farm Holiday Park – 1419 Queen Charlotte Drive, Linkwater, 03 574 2806. Camping sites and cabins (cheapest $60 for one or two people). Anakiwa Lodge – 9 Lady Cobham Grove, Anakiwa, 03 574 2115; 0274 296 022 text. Only one dorm of 4 beds at $35 each, rest are double, twin and family rooms, with cheapest $90 double, $100 twin. Anakiwa 401 BBH – 401 Anakiwa Rd, Marlborough Sounds, 03 574 1388. Self-catering kitchen. Cheapest beds are $100 for double or twin room, or $75 for one person occupying a twin room. The Green Caravan Café is run by Anakiwa 401 and offers tea, coffee, ice creams, sweets, snacks and somewhat pricey ready-to-heat meals. Open 1.30 to 4pm in summer. The rest of the South Island trail is on the Queen Charlotte Track, a very popular and easy trail that takes you to Ship Cove, the place that Captain James Cook, the first European to set foot on New Zealand soil, used on separate voyages in 1770, 1773 and 1777 as a place to re-provision and repair his ships. The track is a nice, relaxing contrast to the ardours of the Richmond Range and an easy end to the South Island TA trail. It is mostly a wide track, broad enough for DoC workers to ride quad bikes and other small vehicles on. It does involves some long climbs, but these are mostly gradual. Travel is through a mixture of native bush, scrub, and some open land, and varies from ridgeline to coastal travel. There are many places to stay along the way, too many to list all here. Most are up-market, though some are more backpacker oriented, and there are seven campsites. Beware of weka stealing your stuff at campsites. Whether you begin or end at Ship Cove, you will need to take a water taxi to or from this point. Cougar Line is the main one. Their boats leave Picton for Ship Cove at 8am, 10am, 1.30am and 6pm (the last from mid-Dec to Easter only) and take about 1.5 hrs. The boats go directly north and then wend their way back down to Picton, stopping at various pickup/drop off points. There is no exact schedule for stop off/arrival at locations along the way, as these are very much according to demand, which affects travelling time. The all-important last time in the day for pick up from Ship Cove is 2.45pm during the summer schedule (1 Oct to 30 Apr) and 2.30 in winter. The fare to Picton is $75, plus $10 if you left your pack at a spot earlier in your walk and want it picked up (it has to be ready on the wharf for collection, something accommodation providers can do). You will definitely have to book for your own pick up from Ship Cove, since if there is nobody booked for a pick up or drop off at a location, the boat doesn’t call in. Note that the booking site doesn’t allow for bookings from Ship Cove, so you will have to phone. 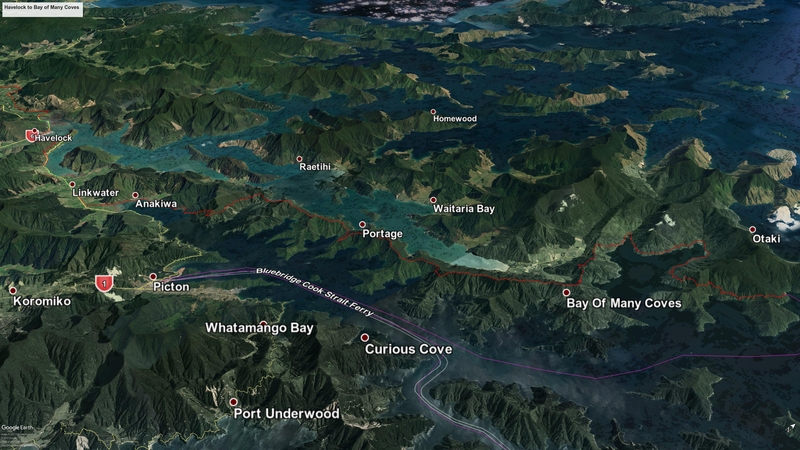 And cellphone coverage on the Queen Charlotte track is very limited, so best to sort this out at Havelock, or at an accommodation on the track with a phone you can use. Cougar Line Water Taxis – Picton Town Wharf, 03 573 7925, 0800 504 090. Office open 7 days, 7am to 7pm Sept to Feb; 8am to 4.30pm March to October. Beachcomber Cruises – Waterfront, corner of London Quay and Wellington St, Picton, 03 573 6175. Picton to Ship Cove dept summer 8am, 9am, 1.30 pm (arr 4pm as this one is not a direct sailing), $66 one way to Ship Cove, incl one pack drop-off. Arrow Water Taxis – 03 573 8229. Seem to be mainly an on-demand service for groups, but you may be able to get a ride on a boat going your direction. There is an $18 fee payable to the Queen Charlotte Track Land Cooperative to use track sections that cross private land. You can buy this at the the Havelock i-Site, Linkwater petrol station (1173 Queen Charlotte Drive), Picton i-site, The Green Caravan in Anakiwa, a machine at the Anakiwa car park, at certain lodges along the way, and online. The DoC brochure on the track is very useful as it lists many of the accommodation options, has historical background, flora and fauna, a good map and shows the altitude profile of the track. The walking times are fairly generous. As the brochure states, they “lean more towards a person with a slow walking speed”. This is along the coast through mature forest. Then it is up around hillsides to the ridge above Mistletoe Bay and 15 minutes or so down to the water. The Mistletoe Bay Eco Village – 03 573 4048, 021 131 8283. The Village includes the campsite (42 sites, kitchen, showers, laundry), ensuite cabins with shared kitchen, and a cottage with bathroom and kitchen that effectively offers dorm bed accommodation ($40 single, $80 double in separate room, or $160 for the whole cottage). This is along ridge lines all the way, passing a road turn-off at Torea Saddle to Portage Bay, location of the upmarket Portage Hotel (with café, bar and restaurant), but also the Debretts and Treetops backpackers and a campsite in the adjacent Cowshed Bay. Black Rock Campsite is further along the ridge, with a shelter (including rainwater tanks), toilets and a very limited number of tent sites (officially 4). Bay of Many Coves Campsite, also on the ridge (and not, despite the name, down in the bay), has the same facilities but more options for camping in amongst the trees behind the shelter. Treetops Backpackers – 03 573 4404 Located behind Portage Hotel. There is a waterfront campsite at Camp Bay, and around at Punga Cove Resort to the east is a nicely located café on the jetty. Punga Cove Resort – 03 579 8561. This place is moderately upmarket but has a ‘Basecamp’ unit with 7 single rooms with shared kitchen and bathroom for $58 ea and a double for $116. The website says the Lodge is gay friendly, not something you usually see advertised in NZ. If you have descended to Camp Bay you can continue on along the foreshore to meet up with the main track as it comes down to the water. The track remains mostly low down into Endeavour Inlet. Before you get to the head of the Inlet there is the privately run camp ground Madsens Camp, and then at the head, another, Miner’s Camp, to the left of the track. Further round, Endeavour Resort and Fishing Lodge (misplaced on Google Maps) offer backpacker accommodation with a kitchen. This is followed by the extensive Furneaux Lodge complex. Madsens Camp – 03 571 8106, no eftpos facility. Miner’s Camp – 03 579 8186. Includes 4-bed bunkroom and one double room. Endeavour Resort and Fishing Lodge – 03 579 8381. Motel units, cabins and backpacker bunks with kitchen. Check in advance it is still going: website taken down, Facebook page not active as at Sept 2018. Furneaux Lodge – Endeavour Inlet, 03 579 8259. This historic lodge has upmarket accommodation as well as small 4-bed bunk rooms charged at a relatively high $58 per person. There are shared showers and toilets but no kitchen. There is a restaurant, café/bar, and a water taxi booking office. The Howden Room restaurant is expensive, but good quality. Cheaper evening meals are available at the bar, “a venue for quality casual dining and socialising in a premium yet egalitarian environment”, as the website carefully puts it. You can leave your pack at Furneaux Lodge for picking up later, so you can walk around the last section without its weight. You will have to pre-arrange this, as the water taxi will only pull into the jetty if there are people or goods to pick up or drop off. And it costs $20. The section round to Ship Cove ascends gently before dropping down to Resolution Bay. Here there is the Resolution Bay Cabins accommodation and further along, the DoC Schoolhouse Bay Campsite. It is a final push up to a 240m saddle then a steep descent into Ship Cove, where there is a memorial to Cook’s visits and toilets. Resolution Bay Cabins – 03 579 9411. No mains electricity or eftpos/credit card facilities. Congratulations, you’ve made it! Take a selfie. The Villa YHA – 34 Auckland St, 03 573 6598. Fat Cod Backpackers – Cnr Auckland St and London Quay, close to the waterfront, 03 573 7788. Atlantis Backpackers – 2 London St, opposite the waterfront (with a park intervening), 0800 423 67642, 03 773 7390. ‘Honours hostel member cards’. Wedgewood House – 10 Dublin St, 03 573 7797. Backpackers further from the waterfront are Tombstone Backpackers, Sequoia Lodge and the Jugglers Rest (all BBH). The Top Ten Holiday Park is 1 km from the waterfront at 78 Waikawa Rd (0800 277 444; 03-573 7212) and has cabins and camping; and Alexanders Holiday Camp is 1.3 km away, at 2 Canterbury St, close to the Jugglers Rest, at the back of town. There is a Four Square at 49 High St, and a large, well supplied Fresh Choice 200m further away from the waterfront at 102 High St. The Interislander ferry – 0800 802 802. Several sailings a day to Wellington, fares $56 to $75 depending on flexibility. Add $45 for the premium lounge and its free meals. The trip on the Interislander or Bluebridge takes about 3hrs 15 mins. Note that the terminal in Wellington is 30 mins or so walk from town. There is a free shuttle bus from 8am to 7pm. Bluebridge ferry – 04 471 6188. Several sailings a day to Wellington, fares $53 to $73. Cabins are available for an extra $30 to $40, but these work best for the night sailing from Wellington. The terminal in Picton is about 1 km from town but a free shuttle bus leaves near the iSite and a couple of other locations one hour before each sailing. The Wellington terminal is well sited, opposite the railway station. Always check the Trail Status pages of the official Te Araroa website for recent changes or alerts on the trail.